Chances are that you’ve never given much thought to how insects walk, or what combination of leg movements–or gaits–is most stable or fastest, but, if like a group of scientists from Ramdya, Floreano and Ijspeert labs, NCCR Robotics, you are trying to create fast and robust robots, taking inspiration some of nature’s most agile movers might give you just the inspiration you need. Multiple insect species walk fastest using a tripod gait, that means that three “feet” are on the ground and three are moving at any given time. Because insects find food and mates by walking around on leaves and climbing up trees, it has long been thought that evolutionary processes discovered the tripod gait to best achieve this kind of climbing over challenging terrain. In contrast, when moving quickly, quadruped vertebrates like dogs and horses tend to only keep one or two legs on the ground at a time. This difference in fast locomotor strategies between insects and vertebrates was puzzling to the researchers and suggested that the tripod gait might not be the best to use in ground-based bioinspired six-legged robots. To test this possibility, the team used computer simulations to model the running gaits of the fruit fly, Drosophila melanogaster. The team then used a Particle Swarm Optimization (PSO) algorithm on the in-silico insect model to discover optimally fast gaits in different environmental scenarios and configurations (e.g. climbing, walking on flat ground). Indeed, they discovered that the tripod gait is best used for fast climbing while new, unexpected bipod gaits with two legs on the ground were faster during ground locomotion – the typical requirement of six-legged robots. To move beyond the simulation, the then tested these new bipod gaits in a hexapod robot. They found that it also moved faster than when using the tripod gait. Finally, the team discovered that when leg adhesion was blocked in real Drosophila melanogaster, insects used gaits more similar to those discovered in the simulation. These results reveal the importance of environmental and biomechanical context in designing locomotor control strategies. Bioinspired methods are finely tuned to the biological challenges they address and may not be appropriate for all robotics applications. Why does this interest roboticists? 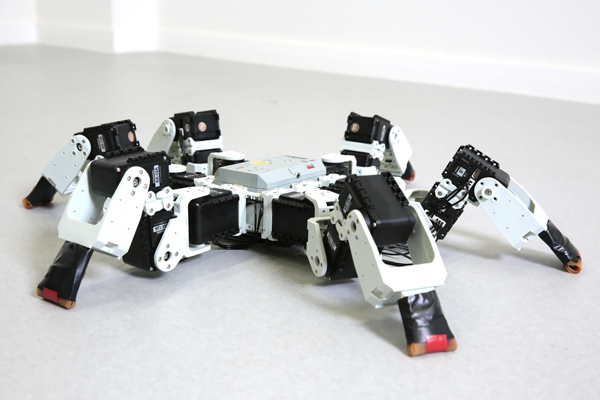 In creating previous bioinspired robots, the group from NCCR Robotics have developed robots that are capable of accessing multiple types of environments to locate victims and better focus rescue efforts. One failing of legged robots thus far, however, is that they are not quick as their biological, or flying, counterparts. 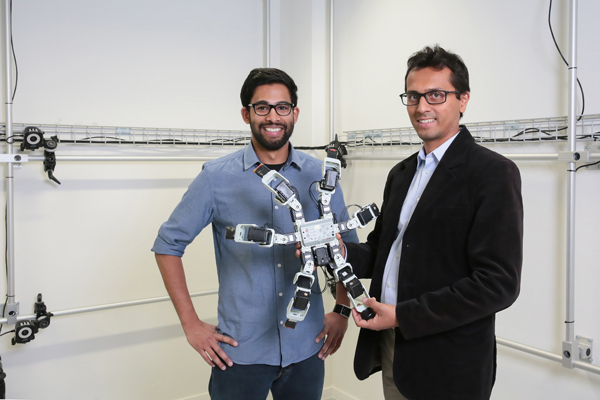 By discovering how walking robots can more efficiently move, they can make the robots more robust and also reduce the energy requirements for a mission. P. Ramdya, R. Thandiackal, R. Cherney, T. Asselborn, R. Benton, A. Ijspeert, and D. Floreano. Climbing favors the tripod gait over alternative faster insect gaits. Nature Communications. DOI 10.1038/NCOMMS14494.